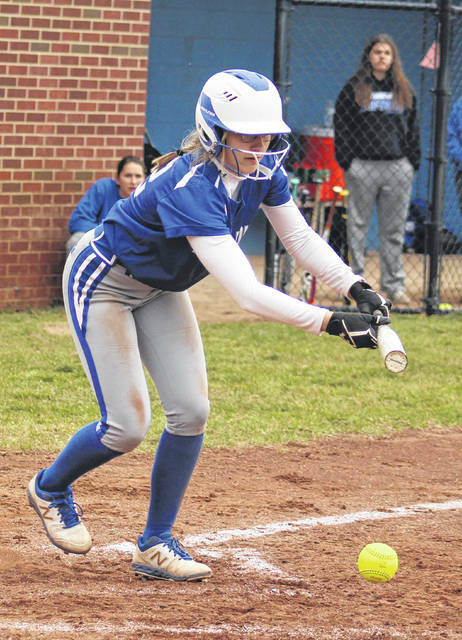 Brooklyn Devenport puts down a bunt for Washington during a Frontier Athletic Conference game against Chillicothe at Washington High School Friday, April 5, 2019. The Washington Lady Blue Lions varsity softball team hosted the squad from Chillicothe High School for a Frontier Athletic Conference game on an overcast, but mild Friday afternoon. Washington took an early 1-0 lead but was held scoreless the rest of the game as Chillicothe went on to win, 13-1. J. Hall was the winning pitcher for Chillicothe. She pitched seven innings with four hits and one run (earned) with five strikeouts and seven walks. Makenna Knisley started and took the loss for Washington. She pitched 6.2 innings with 13 hits and 12 runs (seven earned) with seven strikeouts and five walks. Brooklyn Devenport pitched one-third of an inning with one hit, one run (earned) no walks and one strikeout. In the bottom of the first for Washington, Devenport hit a single to center. With one out, Knisley walked and Maddy Jenkins followed with a single to center that scored Devenport. Jenkins was 2 for 4 on the day with the other hits coming from Devenport and Corynn Chrisman. Chillicothe had four home runs out of 14 hits with one from Hall, one from J. Brown and two from S. Adkins. Washington is at Clinton-Massie Saturday for a doubleheader with the first game starting at 11 a.m. The Lady Lions will be at Jackson Monday. Offensively for Washington: Brooklyn Devenport, 1-1, 1 run, 2 bb, sac, 2 sb; Kassidy Olsson, 0-3, 1 bb, sb; Makenna Knisley, 0-3, 1 bb; Maddy Jenkins, 2-4, 1 rbi; Meredith Pabst, 0-3, 2 fc; Kearria Marcum, 0-0, 1 bb; Corynn Chrisman, 1-3, 1 bb; Emma Funari, 0-3; Haven McGraw, 0-3; Brooklyn Foose, 0-2, 1 bb; Mallori Tucker, 0-0; Kassie Wiseman, 0-0. LOB: 11. Offensively for Chillicothe: J. Hall, 4-5, 2 runs, 4 rbi, 1 home run, 2 sb; E. Fromm, 2-5, 1 run, 2 rbi, 1 2b, fc; J. Brown, 2-5, 1 run, 2 rbi, 1 2b, 1 home run; A. Cunningham, 0-2, 3 bb; H. Griffey, 0-4, 1 run, fc; P. Walsh, 2-4, 2 runs; J. Cocnenour, 1-3, 2 runs, 1 rbi, 1 bb; A. Wade, 1-3, 1 run, 1 bb; S. Adkins, 2-4, 3 runs, 3 rbi, 2 home runs, roe. LOB: 6.